Foreign Visitors: Please contact our Foreign Visitor's Office at (321)494-8563 prior to making reservations. Room charges must be paid in advance at check-in with cash, check or a valid credit card. LODGING RESERVATIONS CANNOT BE MADE THROUGH THIS WEBSITE. We're Pet Friendly! We offer four (4) pet friendly family units located on Hwy A1A south of The Tides. Priority is given to active duty members on official travel. However, Space A guests can also bring pets. Rottwielers, Pit Bull Terriers, snakes and other exotic pets are not permitted in these quarters. Pets must be caged inside unit when guests are not in the room. Pet cages and litter boxes are provided. The Space Coast Inn provides lodging excellence in support of the 45th Space Wing readiness and peacetime mission. Lodging professionals providing world class accommodations for active, reserve and retired military and their families. All lodging rooms have refrigerators, microwaves, free WiFi, cable TV, DVD players, coffee makers and free self-serve laundry facilities on site. Note: Pet fees are $10 per night plus the room rate. Note: Lodging guests may be directed to vacate rooms to support higher, short-notice mission requirements as determined by the installation commander. For local hotels, all official travel must go through the Space Coast Inn to obtain a non-availability form. The Space Coast Inn offers free High Speed Wireless internet in all lodging guest rooms and the main lobby. In addition, lodging boasts new state-of-the-art phone systems with full communications capabilities, including a "Mass Alert" notification option to notify all lodging guests in the event of an emergency. TLFs have additional amenities including full kitchens with full-size refrigerator, full-size stove, full-size dishwasher, and a stackable washer/dryer. Housekeeping services are provided daily. A few TLFs are pet friendly and will require an additional $10 daily pet service fee. Shot records and pet identification are required at check-in. For your protection and comfort, and that of other lodging guests, you are reminded that certain buildings and rooms do not allow children and/or pets. Guests with pets or children in unauthorized areas will be assessed additional fees and may be asked to vacate. You may contact our reservations department 24 hours a day at 321-494-5428 or 6591, or come visit us in building 720 adjacent to the Fitness Center. The Riverside Dining Facility (base dining hall) is open to all guests and their families with a DoD ID card. Normal operating hours are 6:30 am - 6:30 pm but subject to change. Other on-site Force Support Squadron activities include The Alley (Bowling, Cafe, Bar, Bistro), Marina, Golf Course (Golf, Cafe, Pro Shop), Fitness & Sports Center, Leisure Center (Tickets, Travel, Trips), The Tides Collocated Club, and Outdoor Recreation programs. 79% or up to 15 days per reservation Up to 14 days in advance If occupancy is 79% or below, SA reservations can be made up to 120 days in advance. Exception: During the Holiday season: Thanksgiving through New Years, a reservation may be taken at any time without length of stay restrictions during the year to support the "Home for the Holidays" program. 79% or < Occ Up to 14 days in advance If occupancy is 79% or below, SA reservations can be made up to 30 days in advance. Exception: During the Holiday season: Thanksgiving through New Years, a reservation may be taken at any time without length of stay restrictions during the year to support the "Home for the Holidays" program. Note: During permanent change of station (PCS) season which runs from Jun 1 through Aug 31 annually, SA reservation for all TLFs including pet-friendly TLFs will be limited to 3 days in advance and for 3 days at a time to ensure miitary members PCSing with families have priority. SUNDRIES: Sundry items (snacks, beverages, and microwave meals) are provided in some rooms. They are "pay per usage" items, and are inventoried daily. Any items used are posted to your room account. If the items are not stocked according to the inventory sheet in your room, please advise the front desk immediately. Lodging guests may purchase snacks, beverages and microwave Heat-and-Eat entrees at the lodging front desk in building 24 hours a day. Free coffee, tea and hot chocolate are also available, along with free wireless access and free computers for use by registered guests. AMENITIES: Amenities (soap, shampoo, etc.) are provided free of charge upon check-in. Coffee, tea and condiments are provided and replenished daily, or as needed for all visiting officer and enlisted quarters. For TLF facilities, coffee and tea are provided at check-in only. Amenity and cosmetic items are available for purchase at the front desk. PERSONAL MAIL: Military personnel on TDY or in PCS status to Patrick AFB who want to receive personal mail, should go to the Postal Service Center, bldg 424 or call 321-494-8740 and inquire about getting a mail box. 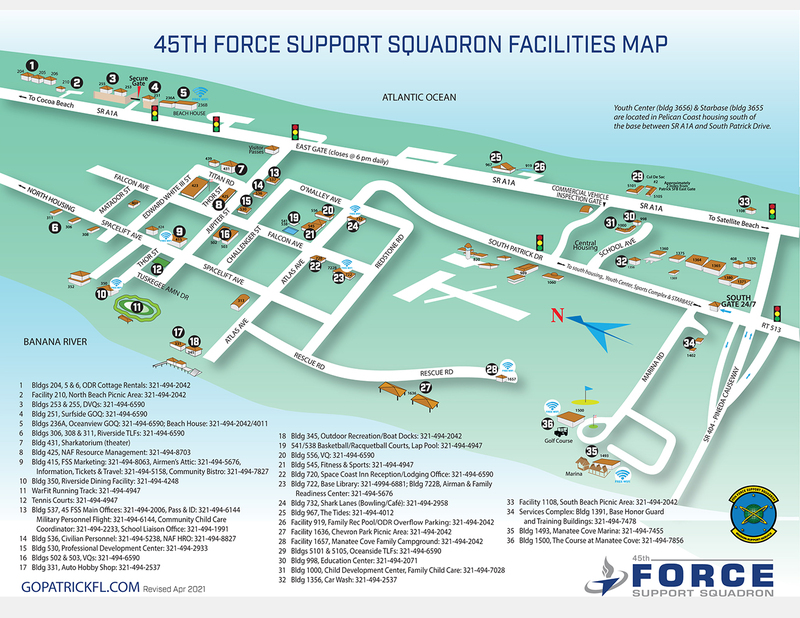 Personal mail cannot be delivered through the 45th Force Support Squadron. Other commercial couriers such as Fed Ex, UPS, Emory, etc., can also deliver packages to the Postal Service Center. If there are any questions, please call the PAFB official mail manager at 321-494-4195.